In the late 1980s, there were two landmark events in Leonel Arguello’s life. Arguello has worked at the park ever since, and he is now Joint Chief of Resource Management and Science, often collaborating with partners such as the League to implement restoration projects. Today, his foremost task as chief is much the same as when he was hired as a student so many years ago: help restore the park’s world-renowned redwood ecosystems. Much of Redwood National and State Parks (RNSP), outside of its old-growth forests, are still recovering from intensive industrial timber operations. Extensive second and third-growth forests, dominated by Douglas fir and crowded with trees, are in need of management to help restore redwood dominance, create wildlife habitat, and accelerate the growth and recovery of old-growth forest characteristics. Moreover, these forests are crisscrossed with old logging and skid roads and non-functioning culverts that continue to fail and collapse, causing massive siltation of spawning beds within adjacent streams. While these forests and old roads present clear challenges for restoration managers, a full accounting of the issues facing the park is as extensive as it is complex and include, for example, invasive species, loss of grasslands and woodlands, impaired waterways, and a non-functioning estuary. A great deal of restoration work has been accomplished in the parks, yet there’s still much more to do. And park resource management staff continue to work unrelentingly every day to fulfill their mission. Removing roads to reduce the threat of erosion is a top priority within RNSP that is identified in all of its management plans. “The NPS broke new ground in the mid-1980s when the park started using heavy equipment to remove roads and restore stream channel alignment. The importance of this work cannot be overstated. When roads fail, it has a devastating impact on water quality and fish habitat, exacerbating problems for imperiled salmonids like coho salmon,” Arguello says. Arguello points to the park’s joint efforts with Save the Redwood League as a prime example of fruitful collaboration. “The League has provided funding to help with road removal and forest restoration projects in the Mill Creek watershed,” says Arguello. 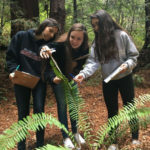 More recently, the League provided critical funding to the National Park Service to help compile data that will lead to the development of a management and restoration plan for 8,000 acres of lowland redwood forest in the Prairie Creek watershed. The continued success of restoration activities in RNSP, now more than ever, depends on the successful partnerships between agencies and organizations such as Save the Redwoods League. It is only through successful collaboration that the park can continue to restore watersheds, protect stream and fish habitat, and improve conditions within its young forests. These efforts lead not only to better functioning redwood ecosystems, but also help ensure that this park will continue to amaze and inspire park visitors well into the future. This year’s Earth Day theme was focused on environmental and climate literacy, which means that we need to make sure everyone is educated on the impacts of climate change on our planet and the actions we can take to protect and sustain our environment.